Malaria is directly translated to bad- air, which for a long time people believed, much like the Black Plague, was spread due to “bad air”. 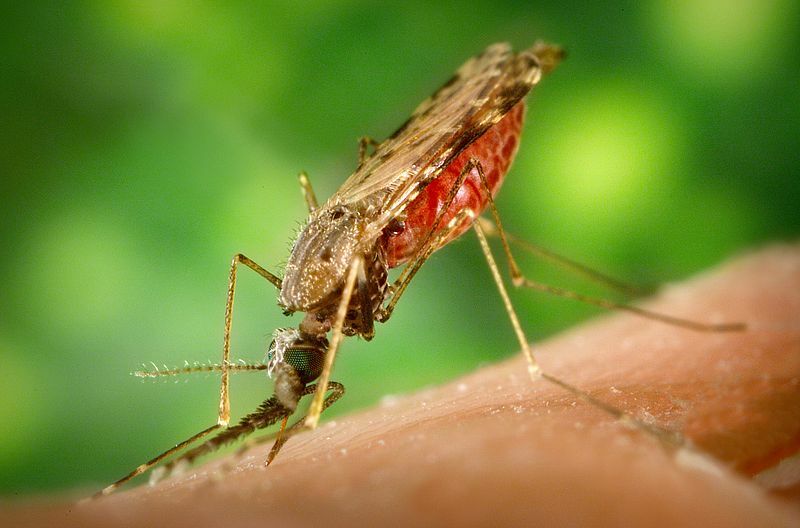 Malaria, despite modern advancements in medicine, continues to cause widespread infection and death in many parts of the world, especially in tropical regions. We now know Malaria is an infectious disease caused by 4 types of parasites that attack the liver and circulatory system. Humans are exposed to these parasites through mosquito bites. We see people in tropical and subtropical regions contracting the disease because it is the perfect environment for mosquitoes to live in, wet and hot. Mosquitoes, which are the vector, pass malaria on to humans when they bite us for our blood. Mosquitoes get infected, similarly, when they bite an already infected human. There are four types of plasmodium parasites: P. Falciparum, P. Vivax, P. Malariae, and P. Ovale. The parasites that are most common to Thailand are P. Falciparum and P. vivax. The parasites initially lie dormant in the people they infect and then once they reach the blood, symptoms develop quickly. Depending on which parasite you get infected with, the incubation period is usually seven to thirty days. The Anopheles mosquito is the main transmitter of Malaria and typically out at dawn and dusk. Malaria is not a new disease. It was first recognized in China, but never documented, and was then documented in Greece in the 4th century BCE. It affected all the major civilizations across the world from China to Europe, and is believed to have played a part in the decline of several civilizations. The East Asian peoples found that insects transmitted it, and the Romans correlated swampy and humid areas with malaria. It wasn’t until the early 17th century that Europeans found a treatment from their travels to the Americas: Quinine. The Chinese found Artemisinin in Wormwood could also help battle malaria. It was from these two plant derivatives, that the modern day Malaria treatments are made from. Thailand in comparison to the surrounding Asian countries, has almost eradicated malaria. 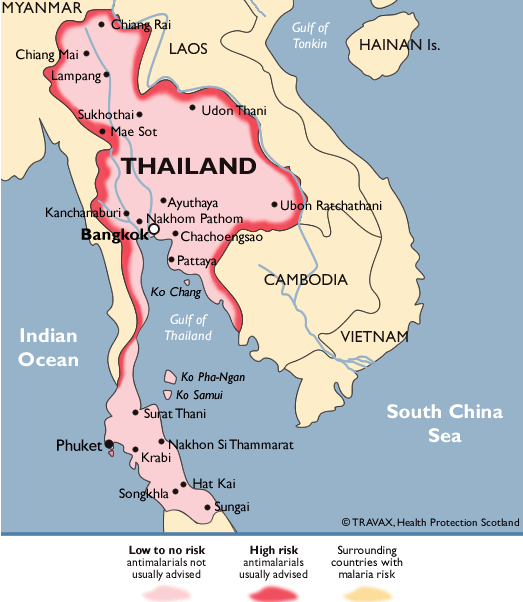 The areas where you will find malaria are the regions separating Thailand from its border countries: Cambodia, Laos, and Burma. There, of course is the possibility of Malaria in the other regions of Thailand, but this generally in very rural, forested areas. It is also important to know that you will only see these out of the ordinary infections during the high rainy season, May through October. Mosquitos won’t travel away from the border regions because they don’t travel long distances, and will keep to a very specific areas, the only reason Malaria is still found in these areas of Thailand is because the countries it borders have not began the eradication process. This is mainly due to lacking resources and because tourists don’t go to the rural, forested regions much. Malaria affects young children, pregnant women, and travelers and people with little to no immunity from exposure, so as a traveller, it is important to be cautious.The rates of serious injury and death have gone down exponentially over the years, in 2000 there were 625 deaths due to malaria, and in 2012 there were 37. While the threat still exists, the likelihood that a traveller for a short period of time in Thailand will get malaria is very slim. To help prevent malaria, there are many types of antimalarials to take before, during, and/ or after your trip. For anyone who is interested in traveling to Thailand, the risk of developing Malaria is low. While antimalarials like Doxycycline, Atovaquone, and Malerone are available, you don’t need them unless you intend to travel into the regions along the Thailand border. One thing to keep in mind is, there is a mefloquine resistance in Thailand, so you will need to take other prophylaxis. However, the key to avoiding Malaria is prevention. Understanding the habits of mosquitoes (active at dusk and dawn, live in and around water sources, etc.) will help make your trip more enjoyable. Wearing the proper clothing will also be beneficial. Light colored long sleeve shirts, pants, and shoes that cover most of your feet will limit the amount of exposed skin that is available to mosquitoes. You can also apply insect repellents to your skin that contain between 20-50% DEET but make sure the sunscreen goes on first!. You can also apply Permethrin to your clothing. 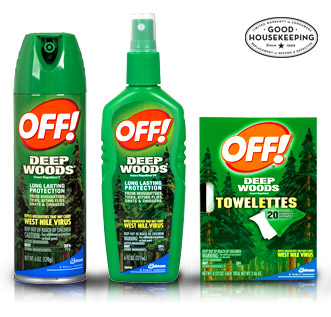 This repellent is sold at most outdoor stores and once applied to your clothing, will remain active for up to six weeks in spite of several washings. You can also protect yourself at night while you sleep by taking several steps. Sleep in an air conditioned building with windows and screens when possible. If that is not possible, then you should consider sleeping under a Permethrin treated bed net. These nets are hung over your bed and will help to keep the insects from getting to you. If Thailand is to fully eradicate of Malaria, it will have to depend on the neighboring countries for help. Thailand has done a great job with eradicating Malaria, but since the mosquitoes don’t understand international borders, the problem will continue to persist. The problem with eradication comes down to an unexpected source: landmines. The steps to eradicating Malaria involve removing the mosquitoes from their breeding grounds. Unfortunately, many of these areas are either covered in, or surrounded by landmines. Until they have been cleared, Malaria eradication can’t take place. There are many ways to keep yourself from being bitten by the wrong mosquitoes, and Thailand will keep persisting in their plans to get rid of mosquitos and the diseases they bring. As long as we are conscious travellers, there is no reason to be worried about anything, especially Malaria. If you have any questions it is best to talk to your healthcare provider or check out the CDC website. Cowman, Alan. F, Berry, Drew, Baum, Jake. (2012). The cellular and molecular basis for malaria parasite invasion of the human red blood cell. The Journal of Cell Biology, 198(6): 961-971.